Another Trip to Tipp, another success! Huge thank you to all who took part in this year’s Trip to Tipp Challenge! Another huge success this year with a massive €25, 614 raised. Thank you very much to Billy & Katriona Shanahan (Blazing Bikers) who organise the event every year, delivering an enjoyable day. A special thanks to Brendan Shields who raised an amazing …Read More about Another Trip to Tipp, another success! This year’s Des Cullen Classic & Vintage Car Show in aid of NCBI was a great success! Thank you to the committee for their time and hard work to organise this annual fundraising event. Angela, Jean and Kevin called to NCBI Head Office yesterday to present us with a cheque of €8,345 for NCBI. Brilliant work by …Read More about Another successful year at the Des Cullen Classic & Vintage Car Show! NCBI’s 12 Hours of Christmas! On Wednesday 19th December, we have our Twelve Hours of Christmas at Marks and Spencer, Liffey Valley, Dublin – WE NEED YOU! 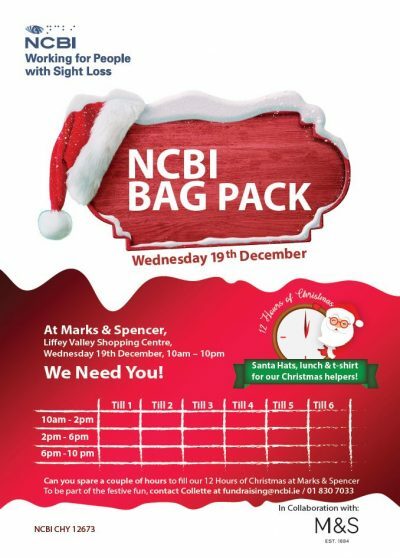 We will be doing a full day of bag packing and we hope to fill the following time slots; 10am – 2pm 2pm – 6pm 6pm – 10pm All volunteers will receive a Santa hat, …Read More about NCBI’s 12 Hours of Christmas! On Saturday 27th October, 10am-2pm, there is a Halloween Fancy Dress Coffee & Tea Morning at our NCBI Shop, Carrick On Suir Spread the word and call by in your Halloween clobber! Today, we bid farewell to Fionnuala Murphy after 13 years at NCBI! Throughout the years as Head of Communications, and over the past year as Head of Foundation, Fionnuala has supported NCBI’s large spanning umbrella of services, retail, advocacy, foundation and everything in-between. Thank you for everything, Fionnuala. You will be missed! 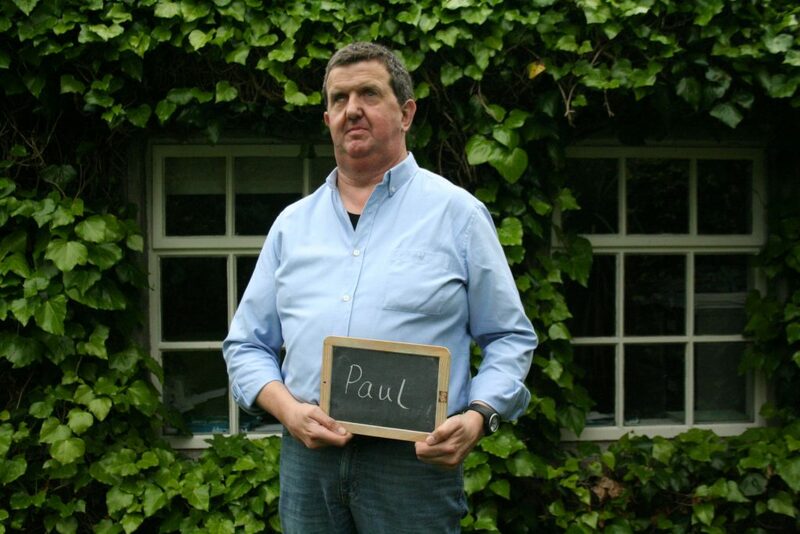 Best wishes from …Read More about Farewell, Fionnuala! Sponsored Awareness Walk in aid of NCBI! 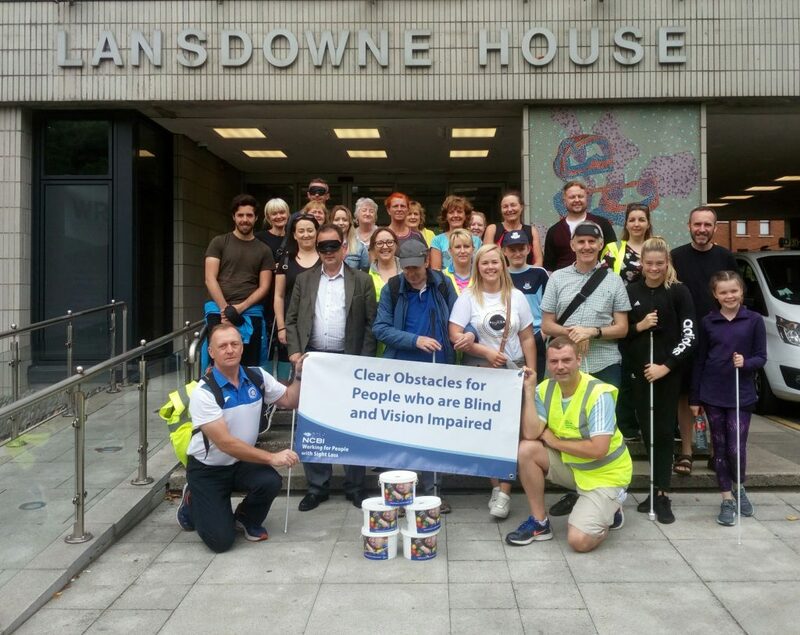 On Saturday 22nd July, Tommy Campbel and friends set out on a Sponsored Awareness Walk to highlight the obstacles faced by people with sight loss on a daily basis. The event, organised by Tommy, ran for it’s second year and raised an amazing €4,687 for NCBI services! A huge Thank You to Tommy and all participants on …Read More about Sponsored Awareness Walk in aid of NCBI! Mark Kehoe said: “I know the huge work involved in raising such funds and I would like to convey a sincere thank you to all involved including Stephen and Karen Cumiskey, Vanessa and Sinead Byrne, Sean Lee and John Coadey who acted as Quiz Master and prepared the questions. Thanks to all those who supported …Read More about Quiz Night raised €750!